APQP: For product features, the APQP and FMEA are introduced in the design stage of the product. Jumpway makes an effective control plan utilizing each department's experiences; and exams the feasibility of the control plan and process capability during the trial run. Execution of control plan: We execute the control plan during material reception, process to final product inspection, during mass production through SPC Control, sampling plan, color management, exception management, and jig assistance. Customer complaint: When there is a quality problem from our customer, we will confirm the problem first with the customer to find out the cause of the problem. Then we will establish the short term corrective action and long-term corrective action using the 8D method. After we determine the real cause, we will establish work guidelines and standardized corrective process to prevent re-occurrences. Measuring equipment: Quality Control establishes the required precision measuring instrument needed, and correct measuring method for each individual part. 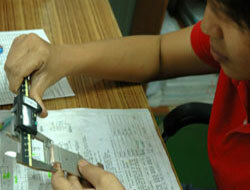 For the measuring method, we guarantee the accuracy and repeatability through MSA. For measuring equipment, we have precision measuring instruments like PMC Vision Machine, Perthometer Concept Machine, CMM Machine, roughness Test, Concentric Measurement Machine, Hardness Tester, and Profile Machine. 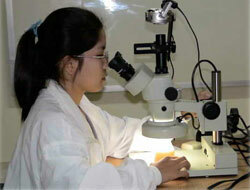 For electroplate process we have X-ray Thickness Testing Machine, I.C.P Chemical Testing Machine and laboratory. Because of our value on quality, we are certified by ISO 9001 and TS 16949, and endeavor to provide high quality to our customers.